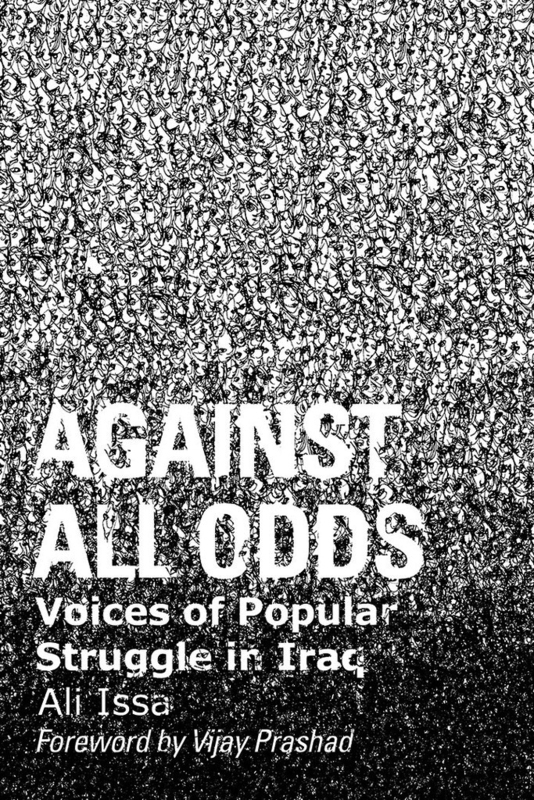 “There are actual people in Iraq… [Iraq] is not just a term used to describe a larger imperialist or geopolitical project.” So says Ahmed Habib in his interview with Ali Issa, author of Against all Odds: Voices of Popular Struggle in Iraq. Habib worries that in America, “Iraq” has become a verb, a synonym for “stuck in a quagmire that costs a lot of money and lives,” and this usage informs a particular American perspective. It is a perspective that prefers non-intervention for all things military out of a humanitarianism, but a humanitarianism that is ignorant of the histories of other countries and is unwilling to listen to people on the other side of American borders. Habib points to the problems with the bumper sticker “Don’t Iraq Iran”: only a self-centered American voice can endorse that slogan, rather than a voice that has incorporated the desires and hopes of those the American military threatens. This kind of international American perspective is not impossible, and it is desperately needed. In Issa’s book, Iraqis in Iraq and in the diaspora tell how they are struggling to make Iraq democratic, peaceful and equal. If those who opposed the US invasion of Iraq listen to these stories, they will notice a number of similarities in the kind of struggles that Iraqis face from the government and the problems that arise in working together. In addition, the voices in the book emphatically assert that the distinctive history of Iraq demands that any estimation of the challenges it faces must be rooted in the particularities and politics of its location. Any truly informed American perspective must listen to such voices. While reporters frequently put Iraq in the headlines and pictures of Baghdad on television, this informational barrage is not the same as listening to the people of Iraq. Furthermore, ignorance about Iraq is not limited to those for whom the voting booth is the beginning and end of their political engagement: how many people who came to Zuccotti Park to take part in Occupy Wall Street knew that the Organization of Women’s Freedom in Iraq (OWFI) had written a letter of solidarity to the American movement? How many even knew that the Arab Spring had reached Baghdad? For Issa, these questions of awareness and cross-border connections are of personal and political significance. Born in Texas to a father from Baghdad, Issa describes his summers flying from the US to visit his family that had fled from Iraq to Jordan. Informed by these frequent journeys as well as a political education that included frequenting anarchist book stores and agitating for workers’ rights, Issa first wrote a blog titled, Iraq Left: On Iraqi Organizing and Movement Building Now, and then became a national field organizer for the War Resisters League (I should note that I volunteer with the War Resisters League). This book contains some work that Issa had previously written for his blog, but much of the content is here in print for the first time. 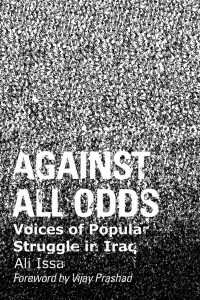 Against All Odds begins with twelve documents that range from articles to press releases to Facebook posts to comic strips to open letters, such as the one from the OWFI to Occupy Wall Street. These sources provide glimpses into how Iraqis, like Americans, struggle to challenge patriarchal traditions and laws, to protect their water and oil supplies, to conserve their environment and to hold the Iraqi government accountable for providing electricity, safety and democratic control over their own fate. al-Abadi, a Sunni, as president. Americans know that such unwritten systems do not disappear so easily, and just as Obama’s election did not herald the end of American racism, the quota system in Iraq continues even after Abadi’s election. Nadia al-Baghdadi, who works on the Save the Tigris and Marshes Campaign, explains in her interview with Issa that because of the quota system, when her organization was attempting to find space for their offices, the same governmental agency first approved their space and then rejected it. Two different blocs in that agency were competing with each other, a consequence of the nepotism that shapes much of the government and business in Iraq. Despite the quota system obstructing people like al-Baghdadi, Iraq is still the location of great transformations. Among Issa’s interviews, the most powerful story is that of Jannat Alghezzi, now the Media Director of OWFI. Alghezzi first came to OWFI in order to flee her family. After staying in a OWFI safe house, where she learned about politics and feminism, she began to volunteer with the program and ultimately joined their staff. Alghezzi tells how OWFI confronts the traditions that harm Iraqi women, such as honor killings, but also takes a stand on governmental policy. OWFI was a leading opponent against the Jaafari Law proposed in 2014, which threatened to make it harder for women to claim property through either inheritance or divorce. Issa conducted most of his interviews, such as with al-Baghdadi and Alghezzi, in 2014, three years after most of the collected documents. Out of the twenty combined interviews and documents, there are only four pieces that are from 2012 or 2013. While there may be many reasons for why he clumped the documents and interviews the way he did, Issa only briefly notes the three-year gap in his introduction. He more explicitly addresses how there is only one entry from Iraqi Kurdistan: an interview with Akram Nadir, an active member of a number of worker organizations. While Issa does not claim that the book represents anything more than a tiny portion of Iraqi voices, it is hard not to imagine him following up on the stories mentioned only in passing, such as the prison revolt in Tikrit of March 2011. Sometimes these stories might sound very familiar to activists in America: at a sit-in in Mosul in April 2011, a poet got a round of applause for insulting George W. Bush. Those who attended the last days of Occupy Wall Street, when the police “guarded” the entryway of Zuccotti Park, will sympathize with the Iraqi protestors of July 2011, who were prohibited from entering Baghdad’s Tahrir Square with posters, markers, pens or even water bottles. The prevalent debates among Iraqi activists might also sound familiar for Iraqis also struggle over the effectiveness of nonviolence and the precise implications of certain words. In his interview, Falah Alwan discusses how even describing the Sunni and Shi’i as working towards “unity” can be problematic, as it reinforces the idea that the two groups are normally separate and only work together under unusual circumstances. However, Iraq is indeed on the other side of the world, and details about the frequent black-outs and kidnappings make clear that Iraqis face everyday frustrations and dangers that people in America are oblivious to. A number of Facebook posts describe how, during the summer of 2011, an anonymous group kidnapped Thurgham al-Zaidi, a prominent critic of the American occupation. After enduring almost a week of torture, he was suddenly released. Undeterred, he headed to the next anti-occupation protest with his son Haydar. That these protests of the Iraqi Spring were directed against the American occupation is why there was so little coverage in the American press. It is only through the efforts of incredibly dedicated people like Thurgham, along with his brothers Uday (mentioned above) and Muntadhar (famous for throwing his shoes at George W. Bush) that such protests were possible. Issa’s book celebrates such resistance while pushing for a future solidarity that is truly international, one that is present on the streets as well as on Facebook.